On April 28, Moxie Outdoor Adventures, a whitewater rafting outfitter located in The Forks, Maine completed the purchase of the whitewater rafting operations of North American Whitewater Expeditions, one of Maine's oldest rafting companies. North American Whitewater Expeditions conducts rafting trips in Maine and Connecticut. This purchase follows an earlier purchase by Moxie of North American Whitewater's rafting operations on the Deerfield River in western Massachusetts. The purchase included rafts and rafting equipment, vehicles, marketing assets, permits for Maine and Connecticut and a 60-passenger allocation on the Kennebec River in Maine. Moxie Outdoor Adventures owner, Clifford Stevens, began his rafting career in 1980 as a whitewater guide, river manager and minority owner of North American Whitewater Expeditions. In 1992 Stevens and his wife, Michelle, purchased All Outdoors rafting company along with Moxie Lake Camps on Moxie Pond and founded Moxie Outdoor Adventures. In 1996 the couple acquired a five-bedroom farmhouse and 600 square foot office on 35 acres of land on Route 201 in The Forks, allowing the company to stage river trips on the milder lower Kennebec River. The property is located near the Kennebec River trip terminus and at the start of The Forks Area Scenic Hiking and Mountain Biking Trail. The North American Whitewater operations will be based at this property. In 2000, keeping the historical integrity of the classic Maine Sporting Camp, Stevens renovated the cabins at Moxie Lake Camps incorporating a retail store and common day lodge. The Lake Moxie House, sleeping 15 guests was built on an adjacent piece of property. Moxie Outdoor Adventures employs 50 people and carries over 8,500 passengers on the Kennebec, Dead, and Penobscot Rivers in Maine, and Deerfield River in Massachusetts. 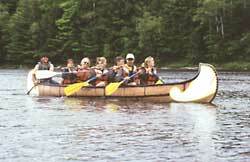 Moxie is famous for its "Kennebec Super Trip". Guided by professional Maine Guides, the trip includes whitewater rafting, inflatable kayaking, a 10 person Voyageur canoe trip and float plane shuttle back from the river for an aerial view of Maine moose and wildlife. This adventure trip was featured on the Maine PBS show "Made in Maine". The Moxie Lake House is open in the off-season for hunting, fishing and snowmobiling. Says Owner Stevens "The trend is for vacationers to stay a little closer to home and still be in an outdoor setting. The boom in green, eco travel is just beginning. All the rivers we raft are in spectacular outdoor settings. The increase in our allocations in Maine will provide Moxie room to grow in this emerging vacation market." "Offering river trips in three New England State makes us accessible to everyone. Our guests can take an afternoon trip close to home or head out and explore New England's wild rivers. A professional, guided whitewater rafting trip is one of the best vacation values for today's traveler." Moxie Outdoor Adventures in a member of Raft Maine, an association of Maine's licensed professional whitewater outfitters, and America Outdoors, the national association of outfitters and guides. Moxie maintains a website at http://www.moxierafting.com and a toll free reservations line at 1-800-866-6943.